I don’t love coffee. If I wanted something scalding, bitter, and hard to swallow, I’d google the Carolina Panthers’ season record. Ha ha. Yeah, that’s one of those jokes that’s kind of more sad than funny. Oh well. My mother (yes, of cross stitching birthday party fame) used to feel certain that I would acquire an affinity for coffee as I got older. Periodically she would test this hypothesis, urging me to take a sip from her cup or buying me something frothy and caramely at Starbucks, only to find that things weren’t unfolding as she anticipated. What can I say? Coffee is gross. I could load it up with sugar and cream (and donuts — can you do that?) and probably choke it down, but if I’m going to ingest that many calories, I’d rather just have some dessert. Paradoxically, despite my antipathy towards coffee in its beverage form, I’ve always loved coffee-flavored confections. Coffee ice cream was my absolute favorite treat as a little girl, for instance. Coffee also plays an Oscar-worthy supporting role in Coffee Cookie Dough Fudge Cheesecake, one of my current faves. 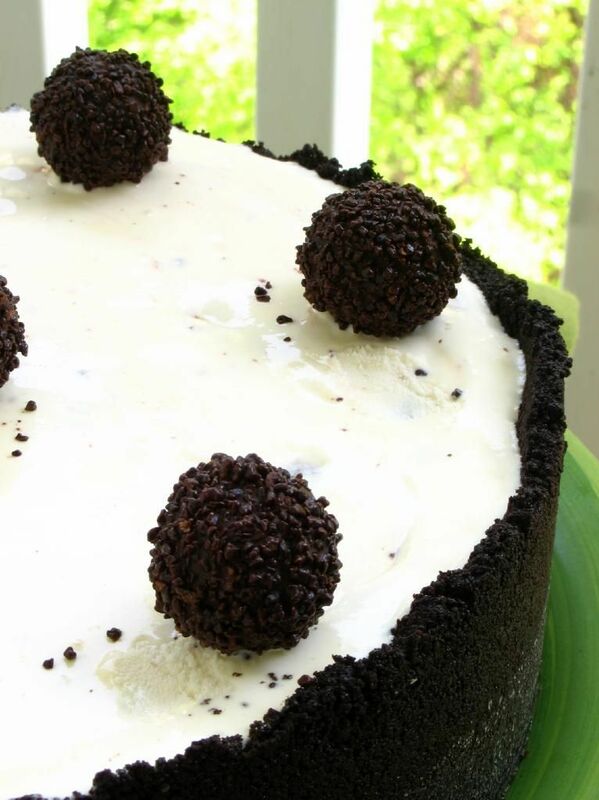 I adore the coffee-brownie combination in my Ice Cream Cupcakes. You get the idea. And besides all those things, I’m in love with this cheesecake. IN LOVE. Like, buy it a ring, get down on one knee, drag it to the altar kind of love. It might be one of the best cheesecakes I’ve ever made. Basically: swoon. For one thing, it has the perfect ratio of rich coffee cheesecake to cold ice cream (oh, and did I mention the layer of fudgy ganache in there as well?). For another thing, the ice cream flavor I chose rocked the Casbah. Apart from inspiring a matrimonial sort of adoration in me, this cheesecake is one of the easiest I’ve ever put together. 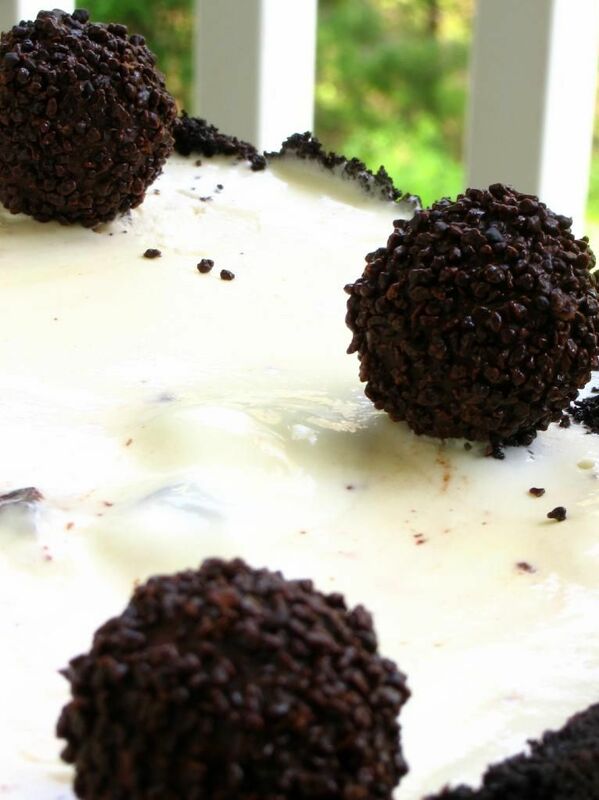 It’s as simple as baking and cooling your cheesecake, softening up your favorite ice cream, and spreading it on top. Freeze the whole thing until it’s firm, cut it with a hot knife, and then call up the preacher. That’s about how it goes. 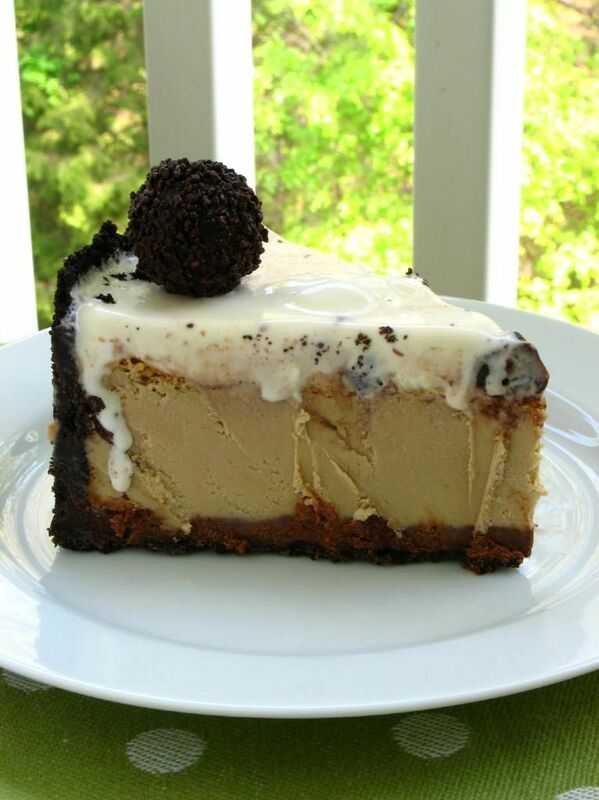 What ice cream flavor would you like to spread all over your coffee cheesecake? Bring the cream to a simmer in a medium saucepan. Place the chocolate in a medium bowl. Once the cream reaches a simmer, pour the cream over the chocolate and let stand 1-2 minutes. Whisk in small circles until a smooth ganache has formed. Pour 1.5-2 cups of the ganache over the bottom of the crust (if you have leftover, save it for eating or decorating with later). Freeze until the ganache layer is firm, about 30 minutes. Pour the filling over the cold ganache in the crust. Enclose the bottom of the springform pan in tightly wrapped foil and place it in a baking dish. Fill the baking dish with hot water about halfway up the cheesecake pan, careful not to let the moisture touch the cheesecake. 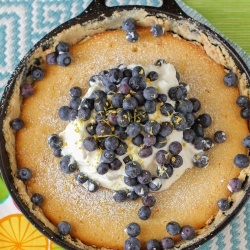 Bake until the top is lightly browned, puffed and cracked at the edges, and the center moves only very slightly when the pan is lightly shaken, about 1 hour. Transfer to a wire cooling rack. Let cool at room temperature for at least 30 minutes. Transfer to the refrigerator and let cool at least 3 hours, until completely chilled and set. Soften ice cream of your choice (I used Ben & Jerry’s Cheesecake Brownie ice cream) for 10-15 minutes or until soft enough to spread. Scoop out a few big scoops onto the top of your cheesecake and spread with an offset spatula or the back of a spoon. 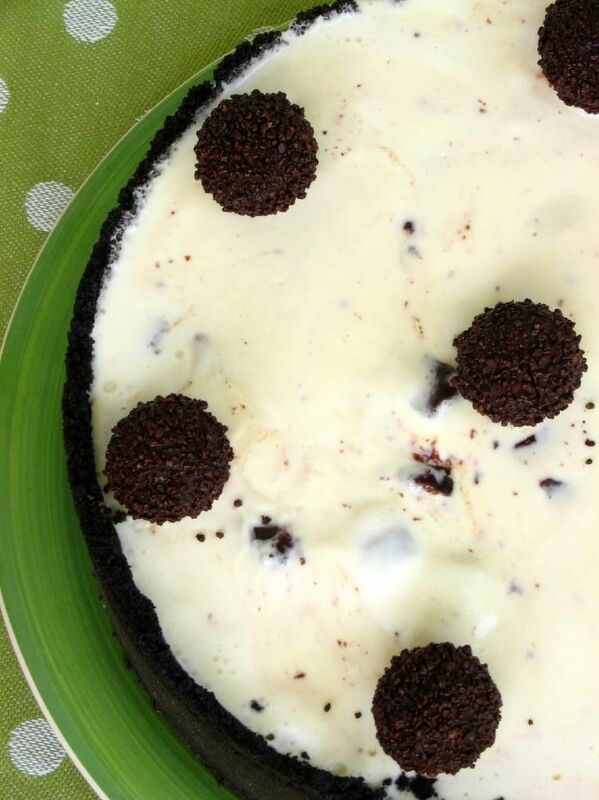 Add more ice cream until it’s flush with the top of your crust. Freeze cake until solid (overnight is best). Decorate with dark chocolate candies of your choice (I used Ferrero Rondnoir). Slice with a knife held under hot water to serve. Keep in freezer when not serving — it melts quickly. Wow! This looks absolutely fantastic. The coffee ice cream seals the deal for me. Thank you! The ice cream is actually Ben & Jerry’s Cheesecake Brownie ice cream on top of a Coffee Cheesecake. That Coffee Cheesecake is just so, so good! I want another piece . . . I do applaud your “more is more” philosophy! 😉 Love the idea of a frozen cheesecake covered with ice cream! Thank ya, Sayre! I loved this thing! Wow! This looks fantastic!! Can’t wait to give it a try! I’ve actually met a TON of people who like coffee in baked goods/ice cream but not in a cup covered in whipped cream. I mean. Not that I drink things like that every day or anything. Hmm. I do love coffee in all of its forms though and I have a feeling this cheesecake will most certainly be one of them! I hope you love it, Joanne! Good to know I’m not too strange… well, not for that reason, anyway. HA Mom, you are officially an addict! This cake looks magnificent. I love every single ingredient in it! I know what you mean, Betty! It freezes well — I have two pieces left in the freezer that I’m resisting. 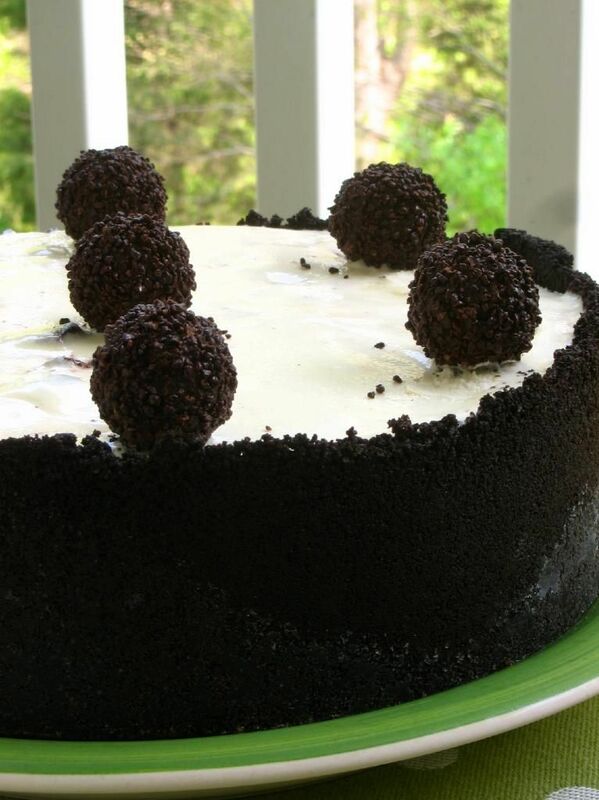 I love this coffee cheesecake ! 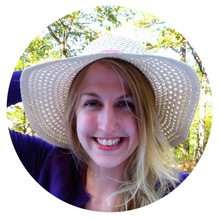 Your lively blog brings cheer to my day. 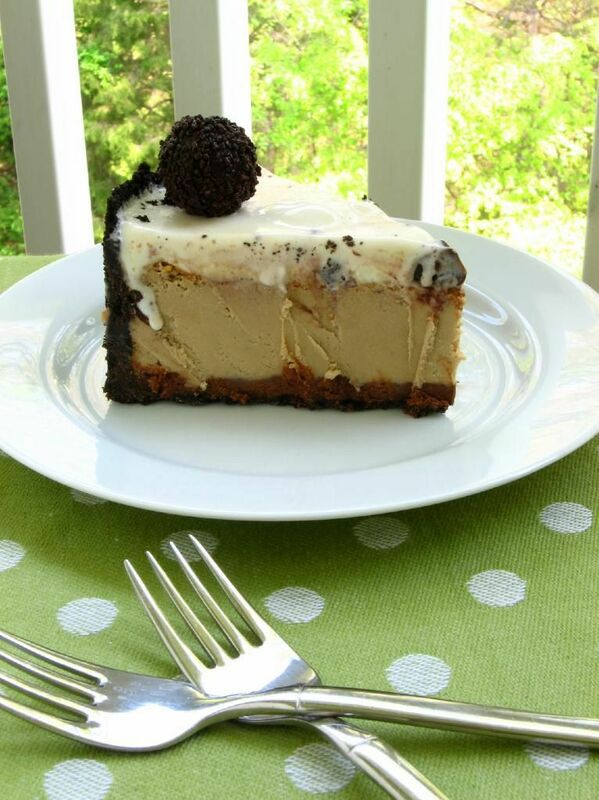 I love the idea of an ice cream-cheesecake combination, and coffee cheesecake is such a great flavor choice. Yum! Thank you! LOVE that coffee cheesecake! I like my coffee full of cream, sugar, and other flavors (not that I allow myself to drink it that way too often), so this would be right up my alley! It looks delicious! I feel the exact same way about coffee – ick! 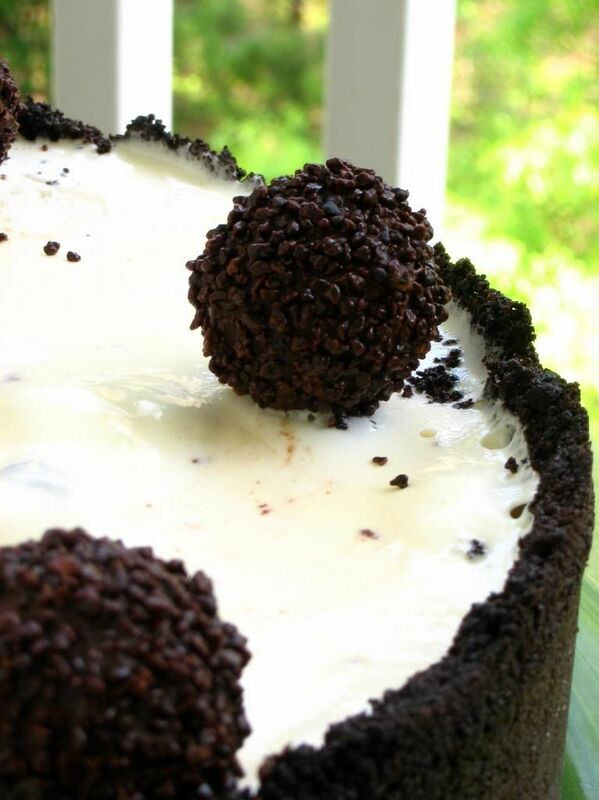 Your cheesecake looks awesome though, totally decadent and sweet. You are on a cheesecake roll and I don’t ever want it to stop! This reminds me of a fancified version of the classic DQ ice cream cake (which I had for approximately 10 birthdays in a row back in the day!). I like what you topped yours with, it might be tasty with some kind of salted caramel ice cream?! HA now I want a DQ ice cream cake! I can almost smell the flavours… Cant wait to try it out..
Wow this looks absolutely delicious. Coffee is my favorite and so is cheesecake, YUM! The opening joke was Dad worthy! Mom’s right about the coffee, she knows how I like mine. Awesome post, the cheesecake looks amazing. I think you should officially be named the Cheesecake Queen! I always love all your cheesecakes! Whoa. That looks amazing. You’ve got talent! Oh. MY! YES!!!! I can hardly stand it Julie. 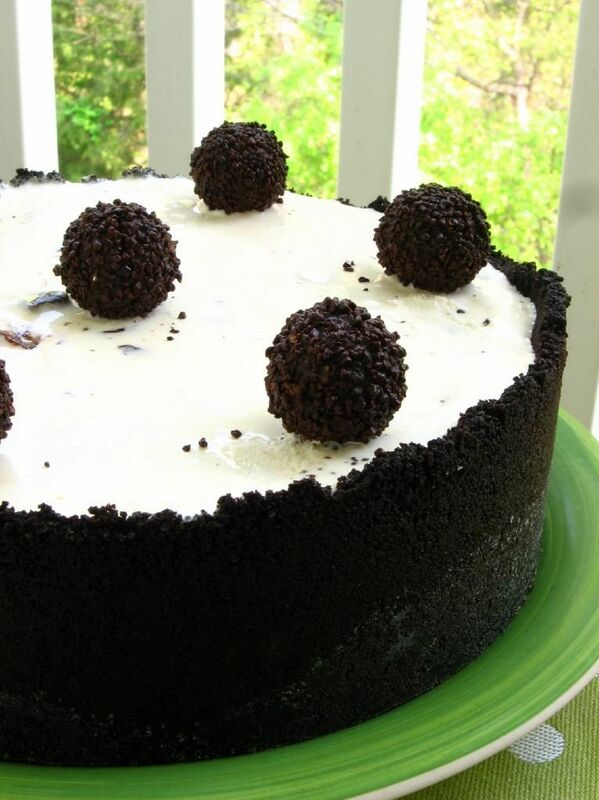 Now…if this was literally a coffee cheesecake ice cream cake it would push me even further over the edge. I can’t wait to try this one!!! I’m so excited! Perfect for summer. And coffee ice cream is my favorite! Thanks for sharing! Oh Julie, Julie, Julie. I’m a coffee addict, so I’m totally making this, like now! where do you get the chocolate sandwich cookies that you use for your crust? & what brand? Hi Jennifer! I just use Oreos (but you can buy a generic if you’d rather). Don’t remove the cream or anything — just process ’em into crumbs. When you freeze the cheesecake after you put the ice cream on top does the cheesecake still taste ok? Is it still creamy or hard like the ice cream would be? I want to make a similar version for a birthday and was worried about freezing the cheesecake because of those reasons. Yours looks delicious so any info or tips ou can give me would be appreciated! Thanks! It will be firmer than if you just chilled it, but not hard 🙂 That’s why cheesecake is perfect for this recipe! I’d still get it out about 10-15 minutes before serving, but I love the texture.